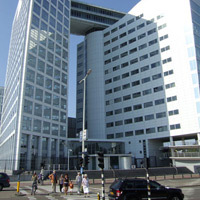 Today, the Office of the Prosecutor, led by Luis-Moreno Ocampo, has requested the International Criminal Court, or ICC, to issue an arrest warrant for First Lieutenant-General Abdelrahim Mohamed Hussein, a senior Sudanese military officer who served as Minister of the Interior from 2003 to 2007 and as Minister of Defense since 2007. The Prosecutor took this action based on the alleged crimes he committed in Darfur from August 2003 to March 2004 as a senior security official for the Sudanese regime. The Enough Project welcomes this important step to end impunity and bring Hussein to justice for war crimes and crimes against humanity. Today’s announcement, however, is not only the first step towards holding another senior Sudanese official responsible for his crimes in Darfur, but also stands as a reminder to the international community of the progress that has yet to be made in bringing Sudanese officials to justice before the ICC. Indeed, in the press release, Ocampo’s office stated that the public announcement of the request was to “encourage further public focus on the Government of Sudan policy and actions, and promote cooperation in taking action to arrest Mr. Hussein and the 3 other individuals subject to ICC warrants…”[i] Hussein continues to hold a place at the center of the Sudanese security apparatus, and the Enough Project believes that he shares responsibility for the ongoing crimes committed by the regime in Abyei, Blue Nile and South Kordofan, all of which are outside the jurisdiction of the ICC. The inability of the ICC to investigate crimes committed in the Three Areas effectively allows individuals such as Hussein, and others, to perpetrate crimes in these areas without international judicial recourse. The international community should, therefore, immediately explore steps to expand the ICC’s jurisdiction to include crimes committed in the Three Areas. This fact sheet explains who Hussein is and where he stands in the security apparatus of Sudan, sets out the allegations laid against him by the ICC and describes the crimes for which the Enough Project believes he shares responsibility in Abyei, Blue Nile and South Kordofan. Who is First Lieutenant-General Adbelrahim Mohamed Hussein? As Defense Minister, Hussein has de jure responsibility for command and deployment of the Sudanese Armed Forces, or SAF. He is currently the second highest-ranking individual in SAF, after Bashir himself, and is the highest-ranking Sudanese official in charge of military operations. Importantly, Hussein is the highest-ranking member of the Air Force, which gives him personal command for the deployment of air assets, as well as the responsibility for the planning and execution of air force operations. From his position in Khartoum’s inner circle, Hussein is alleged to have played a pivotal role in implementing the regime’s genocidal “counter-insurgency” strategy in Darfur. As the Minister of Defense, Hussein adopted in South Kordofan, Blue Nile, and Abyei the strategy and tactics previously used in Darfur. Hussein currently directs the indiscriminate aerial bombing of civilians, forced mass displacement, the use of irregular militias against civilian villages, arbitrary arrest and detention, and extrajudicial killing, just as he did in Darfur. Alleged crimes committed outside Darfur are not within the ICC’s jurisdiction as set out by UN Security Council resolution 1593 (2005). Alongside Ahmed Harun, Hussein was allegedly central to the commission of mass crimes in Darfur. Under his direction, ground and air forces specifically targeted civilian populations. As in Darfur, Hussein and the Government of Sudan are utilizing the tactic of arming proxy militias. Again, Hussein paired up with Ahmed Harun, the current the Governor of South Kordofan. As Sudanese Defense Minister, Hussein directed the use SAF heavy artillery bombardment to take control of Abyei town and the surrounding areas. The bombardment was followed by armed PDF and Misseriya militia elements, who entered the town and committed mass atrocities against civilians in a pattern of attack consistent with SAF and militia operations in Darfur. SAF tactics caused thousands of civilians to flee their homes. [i] ICC Press Release, “ICC Prosecutor Presents New Case in Darfur” 2 December 2011.